Unexpected changes in the market seem to have spelled the end for Microsoft's days supplying ads for games. Sources suggest that Microsoft will shut down Massive, Inc., the in-game advertising agency it bought in 2006, later this month after failing to find a buyer for the company. When Microsoft acquired Massive, its then CEO Mitch Davis predicted a $2 billion dollar market for in-game ads by 2010, but unfortunately for Microsoft, the market never got anywhere near that. 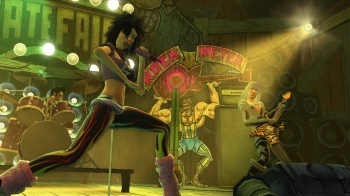 At one point, Massive had contracts with a number of top publishers to provide adverts for their games, including the likes of Guitar Hero and the Madden series. But earlier in the year, EA decided to handle all of its in-game advertising in-house, meaning that Massive lost a significant amount of its business. Sources also suggest that Microsoft had come to regard Xbox Live as a better venue for advertising. When Massive supplied ads for a game, it had to share the revenue with the publisher, whereas with Xbox Live, Microsoft could keep all the cash for itself. Microsoft is said to be integrating members of Massive's technical and marketing teams into other areas of the company, and its general manager J.J. Richards is looking for a new job.